From Pontedeume on the French Way with its Templar castle via the fairytale city of Salamanca all the way to picturesque Porto and beyond. Here are nine of the most magical towns on the Camino de Santiago routes, hand picked by the CaminoWays.com team. With it’s 12th century Templar castle, the historical Camino town of Ponferrada on the French Way definitely has a mythical feel to it. Marketing manager Maria became enchanted by the quaint shop fronts and winding cobbled streets of Conques on her trip on the Le Puy Way last month. 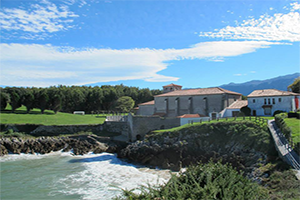 With the lush green hills typical of Northern Spain against dramatic sea cliffs, the beautiful coastal town of Llanes is an undiscovered gem on the Northern Way. A favourite Camino town of mine, if ever there was a city worthy of fairytale status it’s Salamanca. With it’s medieval architecture illuminated at night, Salamanca on the Via de la Plata is simply brimming with history and culture. A trip to the end of the earth is always an exhilarating experience, we can’t get enough of Muxia on the Finisterre Way. Love was in the air in Caldas de Rei this month when our colleague Lisa became infatuated with the Galician village when walking the Portuguese Coastal Way. Little did she know that her boyfriend was planning on proposing at the Santiago Cathedral in just a few days time! 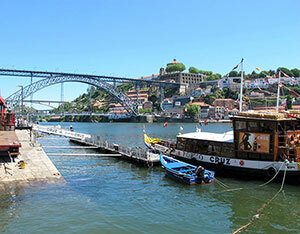 The sun always seems to shine in the vibrant city of Porto. The home of port wine where the sun always seems to shine, there’s never a dull moment in the vibrant city of Porto on the Portuguese Way. Picturesque Pontedeume on the English Way is quite the spectacle, a highlight for us is its beautiful promenade which leads to a 300 year old tree house! O Cebreiro is a favourite for pilgrims on the French Way, its beautiful bridge has become synonymous with the Camino, with thousands of people crossing it on foot each year.